The Carnegie’s Education Department makes the arts accessible to the widest possible audience by providing programming for children ages 7 to 14, 88% of whom are at or below the poverty level and 22% with special education needs. The Carnegie is fortunate to be able to offer our education programs, like Camp Carnegie, at an affordable price, allowing everyone the opportunity to participate. Thanks to funding for general operating support from the Cincinnati International Wine Festival, The Carnegie is able offer its summer camp for $40 and scholarships to those who are not able to pay. Each summer The Carnegie operates a summer camp. Last summer’s theme, which changes yearly, was CAMP CARNEGIE 2015: HIDDEN STORIES. When you look at a painting, what do you see? What sparks your sense of wonder? What makes you ask “why” or “what if…”? This year, discover how a single image can take you on a journey of the imagination. Camp Carnegie 2015: Hidden Stories will allow students an opportunity to explore the story buried in a piece of art. As a group, students will create characters, plot lines, conflict and more, as they make their artwork come to life on the Otto M. Budig Theatre stage. Camp Carnegie includes live performance, hands-on art making, character and costume design, dramatic exercises, writing, brainstorming, team building, problem solving and a great deal of fun. The Carnegie prides itself on its educational offerings engaging all participants, increasing self-esteem, communication skills and taking pride in ones work. The Eva G. Farris Education Center is just one part of The Carnegie. 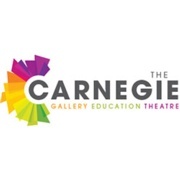 The Carnegie is the largest and only multidisciplinary arts organization in Northern Kentucky offering a Gallery, where over 100 local and regional artists are exhibited each year and the Otto M. Budig Theatre, featuring 4 main stage productions and a concert series. Similar to the Eva G. Farris Education Center, the Galleries are free and the average theatre ticket price is $21.50.